Week 5 of Festive Food and it’s a full-on chocolate fiesta, because what is Christmas without some chocolate? A dang-poor Christmas, that’s what it is! For years, I have resisted making Brownies, because the last time I’d tasted them, they didn’t strike me as anything special. Of course, this was 1987 and I seem to recall that vegetable oil featured rather heavily, so all in all, no wonder. So I decided to turn my rehabilitation eye on the humble brownie and force it to raise its game by using top quality ingredients and adding a bit of elegance to its appearance. What I’ve got for you here is the culinary opposite of those shabby specimens of almost 3 decades ago: it is a multi-layered extravaganza of dark 70% chocolate, real cocoa, fresh butter, rich praline, and creamy milk chocolate. Like Cinderella, humble beginnings have been primped and tweaked and slathered in more bells and whistles than a whole troupe of Morris Men (wack-fol-a-diddle-di-do-sing-too-rah-li-ay!). I’ve made many versions over the past few weeks, but like some glorious cocoa-based Pokemon, THIS is it’s final form. FIVE layers – yes, FIVE! Go on, count them! 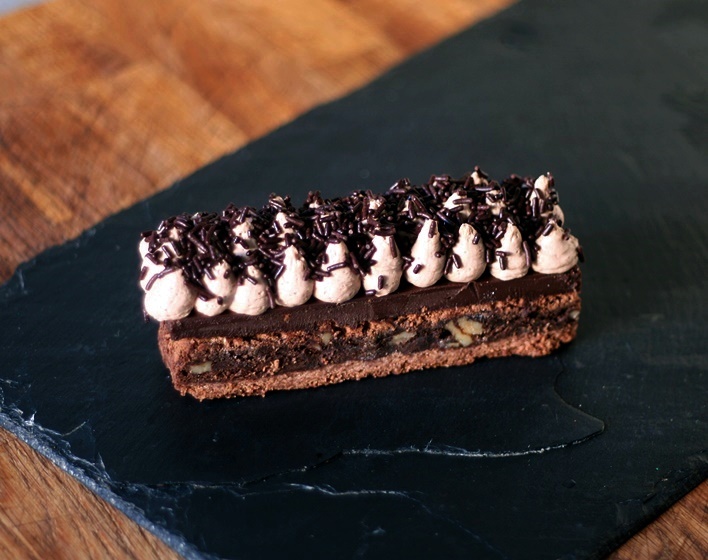 – of indulgence, the textures getting lighter and more luscious as they get higher and higher: from crisp chocolate crunch shortbread, though rich brownie, creamy praline ganache, ethereally light milk-chocolate Chantilly cream and finally, to be topped with shower of real chocolate sprinkles! If you wanted to go all-out, I guess you COULD add a dusting of pure cocoa powder, but that seems a little over-the-top if you arsks me…. If you’re starting to panic about how complicated this all is, stop. It’s not. Yes, there are five layers, but you don’t HAVE to make all of them. The brownie by itself is pretty amazing. Add one or two of the other layers, and it’s a real winner. Pick and choose what you want to make – your kitchen, your rules. This is a 2-day recipe, so don’t think everything has to be done in one go. The bottom two layers are baked in the same tin, one on top of the other, and the ganache is then poured on top – the first three layers all neatly contained in a single tin – no mess, no fuss. The only other thing to do on the first day is to melt some chocolate in cream. So you end up with just 2 items in the fridge. Simples! Chocolate crunch base – makes fabulously crisp biscuits. Brownie – bakes in 15 minutes for a speedy dessert – serve with cream! Praline Ganache – once cooled, can be rolled into decadent truffles and tossed in cocoa. Milk chocolate chantilly – with just 2 ingredients and a little planning ahead, the easiest dessert of all. Real chocolate sprinkles – delicious on bread and butter for breakfast. You need to start it the day before it is required, because the ganache and the Chantilly must chill overnight in the fridge. Apart from that, it’s very straightforward. WARNING: This makes a SLAB of brownie, and due to its richness, serves up to 20. If you’re not wanting such a huge quantity, even though it will last for several days over the festive season, consider scaling the recipe down. Also, if you’re thinking this could be regarded as a serving for 1 (which, technically, I suppose it could be), for the sake of your arteries, consider scaling the recipe down! I make this a pan of dimensions 24cm x 32cm x 4cm. If you haven’t got a tin exactly the same, then just go with what you have – smaller and deeper – or even two small tins – is better, to keep the ganache from overflowing. This is a crumbly, buttery shortbread, but with added feuilletine and ground almonds for two different yet complimentary crunch textures. If you don’t have any feuilletine, use a few crushed crepes dentelles or cornflakes. Line your tin with baking parchment. Leave the edges quite long, so that they stick up well above the sides of the tin. Mix the softened butter, sugar, salt, flour, cocoa and ground almonds in a bowl until well combined. Lightly stir in the feuilletine. Try to keep the pieces a reasonable size, so that they can still be discerned in the cooked biscuit. Turn out the mixture onto parchment and lay some clingfilm over the top. Roll the mixture out to fit your tin. The overall thickness should be between 5-8mm thick. You might find it easier to roll this out onto the baking parchment from the tin, then you’ll know exactly where to trim/patch. Prick all over with a fork (to keep it from blistering) and place in the freezer to harden for between 15 and 30 minutes. Bake for 10-12 minutes and then set aside to cool. The biscuit will be mostly cooked, and will finish off as the brownie mixture bakes. 60g chopped walnuts (or pecans). Increase the oven heat to 200°C, 180°C Fan. Mix the egg yolks and sugar until very light and fluffy (10 mins-ish). Meanwhile melt butter and chocolate. Set aside to cool a little. Beat the egg whites until frothy, then gradually whisk in the sugar and beat until stiff peaks. Gently fold in the whipped egg whites with the whisked yolks. NB Use a balloon whisk for this – it’s more effective and doesn’t knock out as much air as a spoon or spatula. Fold in the butter/chocolate mixture. Fold in the flour and cocoa powder. When thoroughly combined, pour onto the biscuit base in the baking tin. Bake for 15-20 minutes (depending on how baked you like your brownie to be – I went for 20 minutes, because I like a cakey cake rather than a gooey cake). Set aside to cool in the tin. 100g caster sugar ) for the praline paste. You CAN buy praline paste ready made, but it’s generally made with hazelnuts and is therefore not as delicate a flavour as a purely almond praline paste. Put the almonds on a baking sheet and put in the oven. Turn the heat to 160°C, 140°C Fan and let the nuts toast for 15-20 minutes. Put the sugar into a pan over medium heat. Allow the sugar to melt and become golden brown. NB Do not stir, as this will cause the sugar to crystallise. Swirl the sugar around the pan. Put the toasted nuts onto some baking parchment or a silicone mat, and pour the caramel over them. Cut the praline into pieces and blitz it in a food processor to ‘breadcrumbs’. Keep the machine running and eventually (5 minutes or so) it will turn into a paste, as the oil in the nuts is released. Weigh out the quantity you need. Any remainder will keep very well in a sealed box. Chop the chocolate and add to the praline paste in a bowl. Heat the cream to just below boiling point and pour onto the chocolate. Leave for 5 minutes. This waiting time allows the heat of the cream to act on the chocolate and allows it to melt gradually. Vigorous stirring immediately after adding the cream will just create and trap air bubbles and spoil the finish of the ganache. Slowly stir in one direction only to ensure fully melted and combined. Stir in the vanilla, if using. Pour onto the cooled brownie in the tin. It will have sunk a little in the middle as it cooled, but I like also to press the edges down a little, so that the ganache sets as an even layer across the whole brownie. Just press the raised edges gently with the flat of your hand until the surface seems level., then pour over the liquid ganache. If you’re having the ganache as the final topping – and it does set to a beautifully glossy finish, you’ll want to try and get rid of as many of the air bubbles as possible, so that the surface is smooth and shiny. To do this, lift the tin about 10cm off the kitchen counter and drop it onto the worktop. Repeat 3 or 4 times. You will see the bubbles rise and burst through the ganache. This dropping will also help level out the ganache. You can also jiggle the tin from side to side to ensure the ganache has got into all the nooks and crannies. Allow to cool on the side, before covering lightly with foil and putting it in the fridge to set. If it’s still warm when you cover it, you run the risk of droplets of condensation falling onto the ganache. Clingfilm is an acceptable alternative to foil, if you can ensure it doesn’t touch the ganache, as this would spoil the mirror finish. This is a fabulous concoction to have up your sleeve. Once prepared, it has the texture of mousse, but without the fuss of either gelatine or whipped (raw) egg-whites. Great for vegetarians! Chop the chocolate into small pieces and put into a bowl. Heat the cream until just below boiling point and pour onto the chocolate. To ensure that the cream and chocolate are fully combined, you can, while the mixture is still hot, BRIEFLY whisk it with an immersion blender – no more than 4 or 5 quick pulses. Cover the bowl with cling film and chill in the fridge overnight. You can, of course, serve this as a traybake, with or without the chantilly cream, but it is so rich, and looks so pretty when you can see all the layers, I really recommend portioning it out neatly in either squares or fingers. Remove the tin of brownie from the fridge. The Ganache will have set to a lovely smooth and shiny finish. Take hold of the parchment and lift the whole thing out of the tin and set it on the work surface. Slowly peel the parchment away from the sides. Cut up the brownie. This might seem a little over the top, to have a section devoted to cutting up a tray bake, but having gone to so much effort, a little care to ensure beautifully smooth slices like the one in the picture is time well spent. Have a large, sharp, smooth knife to hand. A serrated knife won’t give you the sleek, smooth edge required. Also have a jug of very hot water and a clean tea towel. Have a board/serving dish for the slices of brownie, and a side plate for the offcuts and trimmings. Hold the blade of the knife in the hot water for a few seconds, to heat up. This will allow it to cut through the ganache cleanly. Dry the blade thoroughly with the tea towel. In one smooth movement, trim one of the short sides of the slab, to reveal the layers. Put the trimmings on the side plate. Wash the knife blade clean. This removes all crumbs and traces of ganache, which would spoil the clean cut surface the next time you made a cut. Repeat – heating/drying/cutting/washing the blade clean – until all four sides have been trimmed. Divide the trimmed brownie slab into fingers. My suggestion is for fingers no larger than 10cm x 3cm. Carefully place each cut slice onto the board/serving dish. Remember to clean your blade after each cut, and every serving will be perfect. Prepare the milk chocolate Chantilly cream by whipping it with either a stand mixer fitted with a balloon whisk, or a hand mixer. The setting power of the milk chocolate means that the cream will hold its shape like whipped double cream, but be altogether lighter. NB Be careful not to over-whip the cream – it will take only 1-2 minutes of whisking to thicken up. Pipe the cream onto your brownie slices. For the pattern in the picture, I used a piping bag fitted with a 1.5cm plain nozzle to form ‘kisses’ in rows. Feel free to choose both a different piping tip and pattern. Sprinkle real chocolate sprinkles over the top to finish. http://www.souschef.co.uk is a great online resource for praline paste, feuilletine etc.